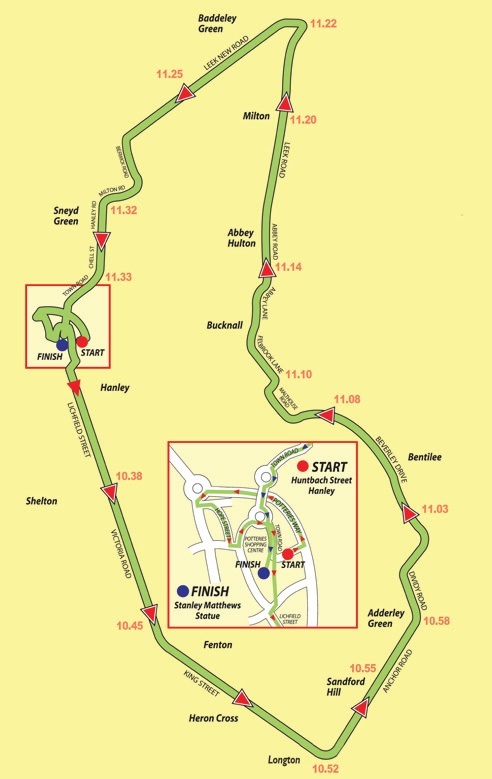 The race follows a well marshalled course with excellent spectator support and a great atmosphere! You’ll be running under UK Athletics rules and a UKA licence. Toilets: Portable toilets are located a few metres away from the Changing areas extra toilets are available in the Indoor Market (Lower floor of the Intu Shopping Centre). The UK Athletics rule is that the only headphones allowed are ‘Bone Conductor Headphones’. Why we advise against any other type of headphones is that it is almost impossible to administer the rule in races with large fields. Wearing any other type of headphones risks disqualification by the Race Referee. Below are the estimated times of the first and last runners to pass landmarks along the route. The Junior Run starts outside Marks and Spencers at 10:50 am. Please wear your race number on your front so we can give you a name check when you finish. The route starts in Parliament Row then takes a right into Old Hall Street, right into Cheapside, right into Parliament Row, left into Stafford Street, right into Lamb Street then left into the finish by Sir Stanley Mathews Statue. You will then receive your medal. The event in chip timed so you will be able to look at the results on our website. Multi Storey car park: Entrances to the car park can be found on Bryan Street and Quadrant Road. Long stay car park: Entrance to the long stay car park can be found on Bryan Street.